kbculture: Mr. Fix-It, I Presume? Despite the sexual equality movement in the 1970s, some gender-based stereotypes persisted. 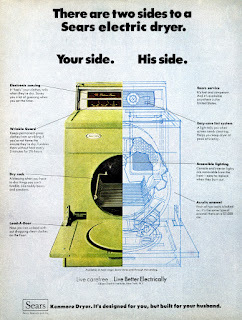 Blueprints are for boys and Avocado Green is for girls in this polarized view of an appliance. But in real life, things aren't so cut and dried. Undoubtedly, some dads are tinkerers par excellence, while others aren't so mechanically inclined. On this Father's Day, let's not take sides, and show appreciation to all dads—regardless of their handymanliness.